Eating fast food every day for a month is not great for you, as proved by Super Size Me. But every day for a year? Well, this guy's doing it, and he's not just healthy -- he's ripped. Devin Cunningham is on a unique challenge to, in his own words, "inspire people to be fit and not give up on their fitness goals," and that challenge involves eating Chipotle every single day for an entire year. As reported by Q13 News, Cunningham, from Bellevue, Washington, is currently on day 315 of his Chipotle challenge, which he started to demonstrate that you can eat your favorite foods and still stay in shape. 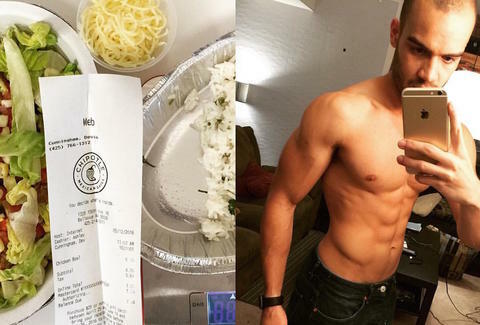 And with this disciplined Chipotle regimen, he was easily able to reach his diet goals. For instance, first he wanted to bulk up. He doubled up on meat, and added guacamole, rice, beans, and every salsa to his Chipotle meal. With that strategy, he was able to gain 16 pounds, for a total weight of 172 pounds. "A lot of people try fad/crash diets like a no/low carbs diets that does not work and then get discouraged very quickly. I want to show people that they can be fit while still enjoying the food they love. When you enjoy what you eat on your 'diet,' and you do it in moderation, it is that much easier to achieve your fitness goals." Pretty impressive. But the guy's Chipotle-filled journey hasn't been easy. For example, the E. Coli outbreak and resulting closures of Chipotle restaurants in Cunningham's area meant that he had to make two separate trips to British Columbia in order to stock up on burritos. During one of the trips, the border agent reportedly told him, "You look pretty good for eating Chipotle." Man, the border agents in Canada are super nice. Luckily, Cunningham was able to get through those Chipotle dark days and kept going strong. Here's his last post from yesterday, when he reached day 314. Day 314 pt. 2 I'll be on the 10pm Q13 news tonight! Keep a look out! And he's still going, telling Fox 31 that because of Chipotle's varied offerings, he's not sick of it yet. Finally, a diet everyone can get behind. Kara King is a News Writer at Thrillist and always pays extra for guac. Send news tips to news@thrillist.com and follow her at @karatillie.